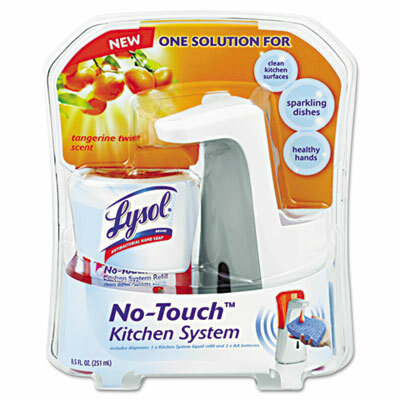 One-stop solution for clean dishes and healthy hands. Powers through tough kitchen grease for sparkling clean dishes. Cleans tough food messes for shiny surfaces. Kills bacteria as it cleanses your hands. One-stop solution for sparkling dishes, clean surfaces and healthy hands. Powers through tough kitchen grease for sparkling clean dishes. Cleans food messes for shiny surfaces and kills bacteria as it cleanses the hands. For use on dishes, glasses, pans, baking trays, kitchen sinks, stove tops, counter tops and for washing hands. Click here to see more Soap Dispensers! Height: 8 3/4" Width: 3"